How an RAF sergeant was killed and his pillion passenger, a corporal, injured when their motor-cycle was in collision with a lorry at Lacock in June was described at the resumed inquest on Tuesday on Sgt Frederick William Rogers (aged 30) who had been living with his wife at 39 Canterbury Street, Chippenham. Rogers who was killed instantly came from the Plymouth district. Dr L Moore, Lacock, near whose house the accident happened, said he went out on hearing a crash and saw a motor-cycle lying in the road alongside a lorry. The rider was lying over the fore part of the machine dead, with his feet pointing in the direction in which he had been travelling. The cause of Rogers death was a fracture of the vault and base of the skull. Witnesses thought Rogers head struck the side of the lorry. Frederick George Bird of 3 Canatx Hill, Lacock said he was standing beside the road when the lorry passed going very steadily at 10 or 15 mph on it's correct side. Witness heard a crash and looking round saw the lorry stationary on the crown of the bridge. The motor-cycle was the falling over, but he saw nothing of the riders. Cpl Ernest Catley, RAF, the pillion passenger said Rogers was familiar with the road had he throttled back to approach the bend at the bottom of the bridge. His speed was about 15 mph and he started to open the throttle to climb onto the crown of the bridge. The lorry was on the peak of the bridge when witness first saw it and there was very little distance between them. 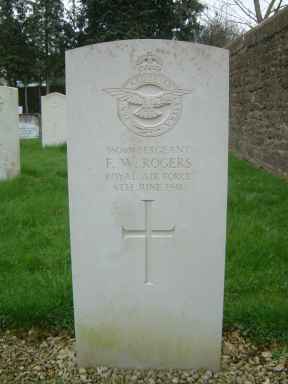 Rogers tried to pull over to the left but there was a scrapping sound and crash and he was thrown against the parapet. Witness received a cut leg, bruised arm and bruised ribs. Entering a verdict of accidental death, the Coroner said this was an unfortunate accident. It appeared that neither driver saw the other until it was too late to do anything. There was no evidence that either of them were driving badly.